[Fri] Agile Coffee Talk: Is Agile Fragile? A strictly informal meet-up ONLY for first generation start-ups. You don’t need to worry about pitches, investors or clients! Simply register and come on down for an evening of great beers and great conversations with Pune’s growing community of entrepreneurs. With rise of IT product companies in India, there is significant demand to spread awareness, get clarity and enhance knowledge base on various functions and roles of product management – understanding the principals and streamlining the product team. Role of product managers and marketers is evolving rapidly. Industry is striving of good product managers. To address these challenges, NASSCOM joins hands with India Product Management Association to create a long run program on Product Management. Product Management Platform 1, a-day long workshop on various aspect of Product Management function, is the first event in this journey. Introduction to Products, and how it is different from solutions and services. Why do Good Products fail? What is Product management and Role of Product managers? What makes a product manager successful? As CTO for the APAC region at BMC Software, he is responsible for driving technical and strategic roadmap of BMC Software products and solutions. As a Director of Incubator Team, he is also responsible for driving incubation and culture of innovation globally for BMC Software. His areas of focus are Business Service Management (BSM) with emphasis on Cloud Computing and Data Centres of tomorrow and Consumerization of IT – adopting be st practices from consumer world and harnessing it for the enterprise. Suhas is also very passionate about the field of Product Management and is the founder and President of IPMA (India Product Management Association) Pune chapter. Prior to BMC Software, Suhas was Vice President of Product Management at Digité. Over the span of over 17 years Suhas has worked on various software product companies such as Rational Software/IBM, Serena Software and Philips Medical Systems. Suhas has diverse experience of architecting, designing and delivering successful software products. He led the UML Modelling team at Rational before IBM’s acquisition. Later on at Pacific Edge Software, he was responsible for building a market leading, enterprise scale Project Portfolio Management software. Suhas holds a MS in Robotics from University of Florida and MBA from FIT. He has High Impact Global Role (2012) and Thought Leadership (2013) awards in his kitty. NASSCOM is a global trade body with over 1500 members, of which over 250 are companies from the US, UK, EU, Japan and China. NASSCOM’s member companies are in the business of software development, software services, software products, IT-enabled/BPO services and e-commerce. NASSCOM facilitates business and trade in software and services and encourages the advancement of research in software technology. NASSCOM is headquartered in New Delhi, India with regional offices in the cities of Mumbai, Chennai, Hyderabad, Bangalore, Pune and Kolkata. Agile Coffee Talk: Is Agile Fragile? Our objective is to enable free flow of conversation on topics of significance to bring better ways to think, innovate , develop and work collaboratively. In two hours we cover various topics of interest in facilitated group discussions and activities under a theme. Do note this is a forum for discussions, food for thought and NOT for drawing conclusions always. Peeyush is the co-founder and CTO at Canvera.com, where he heads the technology and design services delivery. Over the past 20 years, Peeyush has been involved in building various products and technologies that have helped solve real problems in consumer internet, mobile and enterprise space. Prior to Canvera, Peeyush worked at various enterprise software companies based in the U.S. and also helped build the India R&D centers for a few of them. Peeyush is passionate about technology, gadgets, photography, sports, startups, entrepreneurship etc. He is an avid runner and has run a few full marathons. Amit will discuss his experiences and learnings in product management – from helping set up the first product management team in a small startup like company, to the team’s rapid evolution as the company grew to a billion dollars in revenue, in just a short span of few years. Will discuss various aspects of product management ranging from customer requirement prioritization, development support, customer support, product marketing, industry focus, strategy, sales support, etc. Amit Paranjape is a co-founder of PuneTech. He has been involved with several startups in India and U.S. Formerly Amit worked at i2 Technologies. Amit has over 15 years of experience in Product Management, Marketing and Strategy in the Enterprise Software Industry. He has a B.Tech in Mechanical Engineering (IIT Bombay) and an M.S. in Manufacturing Systems (University of Wisconsin Madison). His current interests include consumer internet, healthcare and enterprise software. Different people define it differently. At the very least, a product manager is a person who is the “guardian angel” of the product. He gathers requirements from the market, and defines what the features of the product will be. But in some cases, a product manager might have responsibility of the product engineering. In other cases, a product manager might also have sales and support responsibilities. And sometimes a product manager might have full responsibility for a product – including worrying about the business profit & loss (P&L responsibility). For this talk, we will be using the broader definition of product management. The greater the responsibility, the greater the challenges of doing the role out of India. The product manager’s location is important in two different ways. You can have easy access to the market (i.e. the customers), or not. And you can have easy access to the development team. If you have easy access to both, it’s ideal. If you have easy access only to the market, you can do outbound product management (creating the marketing requirements document from the market research document produced by the strategic marketing team). If you have easy access only to the development team, you can do inbound product management (creating the product requirements document from the marketing requirements document). If you do not have easy access to both, then you are in trouble. In India-based product companies, a product manager could possibly do handle all responsibilities: requirements + engineering + sales and marketing + P&L responsibility. However, product managers in MNCs and Indian services companies, only requirements gathering and engineering can be owned out of India. Support to product sales and marketing can happen within the next 5 years, but full sales and marketing responsibility, and P&L responsibility is unlikely even 5 years from now. Political astuteness. Many product managers, especially those who come from a technical background, ignore this aspect. Know who is friends with whom, which way the wind is blowing, who is trying to kill your product, and a whole bunch of other behind the scenes work that is happening, so that you can keep the future of your product, and yourself secure. You don’t have to be an expert in all these areas, but whatever is missing will hurt you. Figure out which areas you’re weak in and work on improving those. As a result, many engineers (i.e. many Indian product managers) fail at this role and end up doing only inbound product management. So, focus on fixing these issues if you want to succeed. 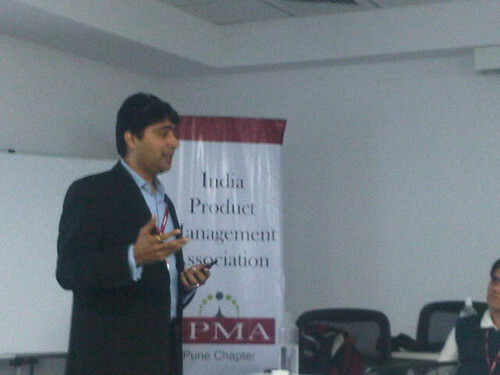 Typically, for product management being done in India, the role is in a very early stage, and is experimental. The responsibilities are ill-defined and evolving. The person given the job is likely to be from a development background, and is likely to have no exposure to other aspects of product management: like sales, marketing, market research, customer management etc. Further he has no access to customers or to market research. In addition, the specific career path for a product manager is not really well defined in India. Overall, the role is quite risky. And if product management role does not work out, what happens to you? It is usually not clear whether you’ll be able to go back to your previous role and career path. As a company, HR should have policies to clarify these issues, so that people feel safe about going into product management. Getting people to do product management in a software company in India is difficult. IIM graduates don’t want to join as a product manager, but they’re happy to go to a HLL as a brand manager. Which is practically the same thing! So what is needed is that the product manager position in software companies needs to be branded appropriately, ensure that the candidate’s perception of the role is correct, and as before, the career paths are defined appropriately. The problems are even worse for smaller companies. They cannot afford to pay higher salaries, provide the facilities and amenities. They don’t have a brand recognition, which is important to current and future employees. And smaller companies are also afraid that if they try to improve their branding and visibility, the larger companies will quickly come and poach employees, leading to attrition and major problems before they can hire new guys. Solution: don’t know! This is a tough problem, and it is unclear whether there is a good answer to this at this time. Understand and seek clarifications on your role, responsibilities, org structure, and processes. Don’t let unstated expectations hurt you! Stay one step ahead of the game. Never stop preparing yourself for a bigger role. Learn new things. Build new relationships with the long term in the mind. Keep thinking about strategic matters. Immerse yourself, but don’t drown yourself in day-to-day stuff. Keep a stakeholder mapping spreadsheet. Keep track of all the stakeholders in your project, and which of them is interested in what outcome, and what is the level of friendliness of these people towards you/your product, and when was the last time you had contact with them. On a regular basis, check whether you’ve been doing anything specific to improve your weak areas. And if you’ve not, scold yourself. IPMA Pune, the Pune Chapter of the Indian Product Manager’s Association, presents a talk by Vivek Tuljapurkar, this Friday, from 5pm to 7pm, at BMC Software, Tower A, ICC Tech Park, SB Road. Indian software industry is experiencing explosive growth beyond its core offering in software services. MNCs are giving their India operations greater responsibility towards product management, Indian software companies are being asked to take additional responsibilities towards requirements management and product management, and the legendary Indian entrepreneurial spirit is in full bloom with many startups looking to launch new products. The Indian environment, like any other, presents certain unique challenges towards product management. There is much commonality to the challenges that are faced by various types of businesses, whether you are an MNC, Indian services company, or a product startup. This seminar aims to discuss various current and upcoming challenges and also possible solutions and is a must for those practicing or aspiring to practice product management. Vivek Tuljapurkar is a management consultant based in Pune. He has held various positions in the past such as Managing Director of Avaya, CEO of Ruksun Software Technologies, Global Product Portfolio Manager at IBM, and Product Portfolio and Line of Business Manager at Eaton Corp. Vivek has twelve technological “firsts” to his credit, has been an advisor or consultant to numerous governments and Fortune 500 companies, and has taught at various prestigious universities in the USA and India. Vivek mentors startups via IIM-A MentorEdge program and Power of Ideas initiative. Are you a passionate Product Manager or Techie who wants to build great products? Are you a Product Manager who wants to network with other professionals? Are you looking to switch over into the exciting world of Product Management? Or simply want to learn the basics of the discipline of Product Management? The Indian Tech world is full of people who understand services, and even product outsourcing. But the one big thing missing from the IT ecosystem here is the ability to visualize and build great products. And, if things go well for the Indian IT industry, then the most important trend of the next 10 years will be the rise of product companies out of India, and with that, the field of Product Management. So, if you have any interest in this area, then the Pune Chapter of the Indian Product Managers Association, which is being launched this Friday is the place for you to be. Vishwas Mahajan, Co-founder and Former CEO of Compulink and member of Senior Management at Glodyne, will inaugurate IPMA Pune Chapter and kick start the Monthly Speaker Series. Membership of the IPMA is free at this time. This event is free and open for anybody to attend, but registration is required. The event will be on 29th April, from 4pm to 6pm, at BMC Software, Tower A, ICC Tech Park, SB Road.